The courses of EuroLingual are organized into 10 different levels adapted to students’ knowledge. They are structured in accordance with the CEFR (Common European Framework of Reference for Languages). 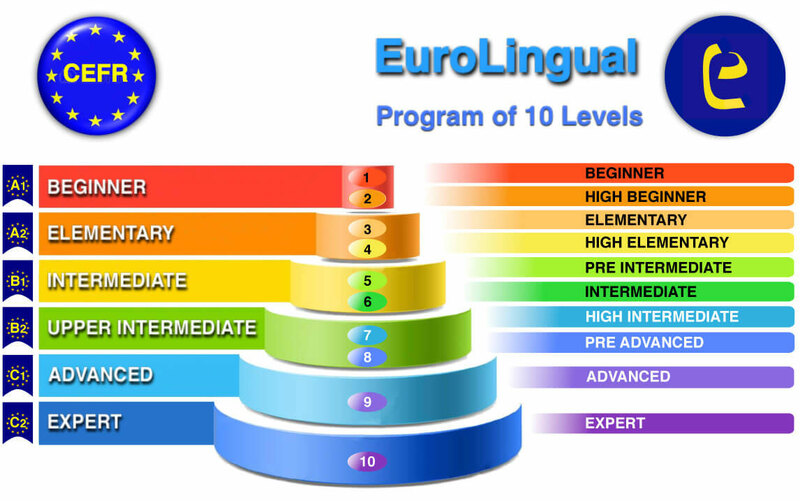 Level 1 is aimed at absolute beginners and level 10 is for students with a level of proficiency close to that of a native speaker. 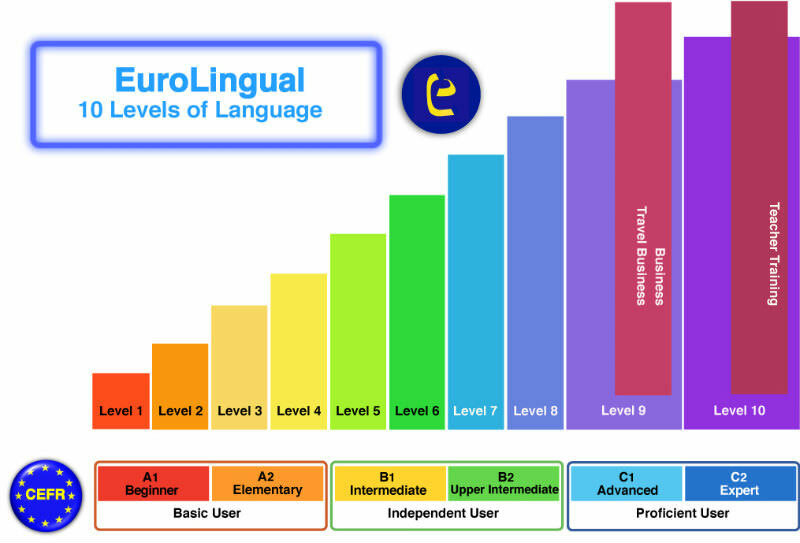 Level 8 closes with all the knowledgement of grammar, the following two levels are for improving the language. In order to ensure students are correctly placed in classes corresponding not only to their knowledge, each student takes a placement lesson involving especially in spoken evaluation. Only one meets your needs! You are a complete beginner and have no prior or very little practical ability in using the language, with the exception of perhaps a few key words or sentences (exchange greetings, give your identity and name a few familiar objects of your environment). Using gestures, pictures, CD's and DVD's you will develop speaking/pronunciation skills and basic vocabulary, grammar and survival language. You are a “false beginner” or "advance beginner" – i.e. you have a foundation but very basic knowledge of the language, with a limited vocabulary. You had some exposure to the language. You have no real understanding of the grammar and can produce no more than a few key words and memorized phrases. Maybe you haven’t used the language in a while, or simply want to start at ‘the beginning’. You can understand and use familiar everyday expressions and basic phrases aimed at the satisfaction of needs of a concrete type. You can order food & drink. You can understand and use familiar everyday expressions and basic phrases, but your ability to communicate is limited and you find it difficult to understand everyday spoken language. You can use and understand simple sentence structures and have come across different grammatical structures, but are not confident in applying them correctly/consistently. You can produce sentences and formulate, and respond to, everyday questions. You have a basic knowledge of grammatical structures, including different tenses and word order, and have enough vocabulary to 'get by' in predictable situations. You can communicate in simple and routine tasks, requiring a simple and direct exchange of information on familiar and routine matters. You can use and understand simple structures fairly consistently, and can respond to a wide range of questions on familiar subjects. You have a reasonable idea of how the verb system works (present, past and future) and an active vocabulary of around 700 words. You can express yourself in familiar contexts, albeit with quite a few mistakes still. You can communicate effectively, if not always accurately, in most everyday situations and could consider working in the country using the language (e.g. bar/counter work, service in cafés, basic office work). You can distinguish the differences among the past tenses and the use of conditional and you are able to narrate in the past. You can produce simple connected text on topics, which are familiar, or of personal interest. You can talk about dreams, hopes and ambitions. Good vocabulary and a fair understanding of fundamental grammatical rules and how to apply them. Reasonably confident speaking in most common, social or work settings and developing fluency in your reading and writing. You want to use the language more flexibly and use appropriate register to suit the context. You also want to understand some of the more complex grammar forms. You can understand the main ideas of complex text on both concrete and abstract topics, including technical discussions in your field of specialization. Grammar is already well mastered, and so is only revised selectively. Now the focus is on the finer points of the language. You can understand the main ideas in details on a variety of complex topics such as news, stories, explanations and instructions, including technical discussions in your field of specialization. You can speak with a degree of fluency with native speakers in a clear way, without strain for either party. You can write clear, detailed text on a wide range of subjects (formal and informal letters, descriptions and summaries of professional topics, research papers, etc.) and explain a viewpoint on a topical issue, giving the advantages and disadvantages of various options. You can understand a wide range of demanding, longer texts, and recognize implicit meaning. You can produce clear, well-structured, detailed text on complex subjects, showing controlled use of organizational patterns, logical flow of text, and clear awareness of the audience. You are native or almost native speaker. The purpose of this level is to continue raising the language level and cultural competence so that you can succeed in credit courses or work in jobs requiring native-like language skills. You are able to use language skillfully, with accuracy efficiency and effectiveness. You can understand a wide variety of styles of speech on highly specialized topics (classical theater, films, professional lectures, public and academic debates, literary readings and jokes and puns). You can write formal tasks, journal articles, professional and academic issues, etc. You can summarize information from different spoken and written sources. EuroLingual knows what you need to improve your language level and we can adjust the method to your tasks.